Digital signage continues to become more and more popular as it proliferates into every industry. Creating a successful digital signage solution for your business or facility will result in more efficient and effective engagement with your viewers, but the actual displays are only a small part of the equation. Here are a few important keys to ensure your digital signage solution is a success. Content is king! You can have the best digital signage set up ever, but if your content is not useful and easy to understand, you will still lose your viewers. You want your digital signage solution to become a reliable source of information. Besides just the actual message, you need to consider how easy it is to read and how well it grabs your attention. Make sure you are using a clear type that is properly sized and isn’t overcrowding the screen; break up long messages with some white space. Also pick appropriate and complementary colors that are easy to read onscreen and most importantly, give your readers plenty of time to read the message before the screen changes. You need to be sure you consider the entire space. If your viewer can’t locate your message then it’s pointless. Think about how each element of the space may or may not affect your displays. Things like lighting, glossy floors, peripheral products, printed signage, furniture layout, etc. can make it difficult for your guests to locate the message. Not only do you need to know your environment or space, you need to make sure that it is kept up with properly. You can create operational standards that clearly explain maintenance procedures for the area so the installation is protected. If information isn’t relevant to what they are doing, your audience may tune out all of what you have to say. Don’t try to cram a ton of different messages and campaigns into one visual. A jumble of various styles and messages that appear unrelated will quickly be disregarded. Have your messaging on point and significant to the visitors’ direct experience. 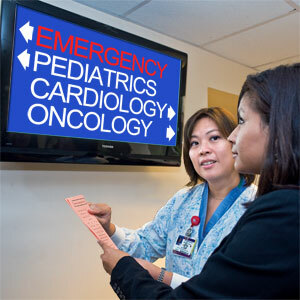 For example, display messages about children’s health tips on the screen in the pediatrics department, not geriatrics. Don’t forget one of the major pros of digital signage, targeted communications, which can greatly increase your odds of success. Through correct planning and implementation, digital signage can deliver the kind of desired and even critical information that is needed by both hospital visitors and staff. 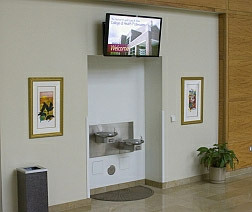 SecurEdge Networks has designed and deployed numerous audio video implementations including digital signage. These are just a few of the many keys to a successful digital signage solution. We are more than happy to discuss it further with you and answer any questions you may have about a digital signage solution for your secure wireless network. You can just contact us here, consultations are always free! We also have a Digital Signage Solution Checklist you can download that would be a great resource for anyone considering digital signage.